Has Na Na lost her mind? She’s showing her undies on the web! Re purposing has been around for a very long time. Even back in the cave man days people took items such as bones to make knives and sewing needles or rocks to make into weapons. What most people today think about re purposing is the Great Depression. I also remember the 70s when the flower power generation tried to live frugally. You don’t really think all those peace symbols and flags sewn on pants were just a fad do you? Many times the patches covered holes in the pants. I see more and more people talking about re purposing items these days. To me its just natural to do so. Even though I had neglected that part of my life for a few years while I took care of my customer’s needs. Retiring has given me the time to go back to my old ways…. and I like it! Something that really…. I mean REALLY bothers me is the store bought clothing women must put up with. Our clothes are made in some far off place where the manufacturer hasn’t a clue how to fit different sizes. The very same pattern used to make a size 5 is used to make a size 18. They just slide the pattern over to add more fabric. I don’t know about you but I’m extremely tired of paying high dollars for clothes that are just crap. Especially undies. Undies are made so that if you get them to fit your behind then the waist looks and feels like its for a Barbie doll. Geeze, you’d think there was a shortage of elastic around the world. So you get something that fits your waist and the behind really droops. We pay high prices for such flimsy undies that they barely last a couple of washings. If we do manage to find a really good fitting pair then we tend to wear them until they are falling apart. Simply because its very rare to find some that actually fit. I was absent mindedly complaining to my daughter the other day about having to start searching for new undies again. The ones I bought last time have barely lasted a few months. I hear something in the background of my thoughts. Huh? What did you say baby girl? Mom, you made ALL our clothes when we were little, even our undies, so why not make your own? Well gee whiz, I should have thought of that! I used to make my own. So why don’t I make them myself? I can think of no excuse. I think some…. Hmm…. I could go to the fabric store and buy fabric for nice silky undies but I refer something more practical. I prefer cotton. Maybe its an age thing. I am a senior you know. So I ask myself what can I use that I own already? At first I thought of all the fabrics in my quilting stash. Naw, those don’t stretch enough. While looking around I happened to spot my t-shirt fabric stash. I save the left overs from making t-shirt quilts. I usually make rugs from all those leftovers. Well heck, it’s the kind of fabric Hanes undies are made from so why not? It’s very durable. T-shirts don’t seem to ever wear out. Tons of them are donated to thrift stores all the time because people grow tired of them before the fabric wears out. So t-shirt fabric it is. What a fine way to re purpose old t-shirt backs and sleeves. Just in case anyone wants to learn to make their own undies, I did this tutorial. 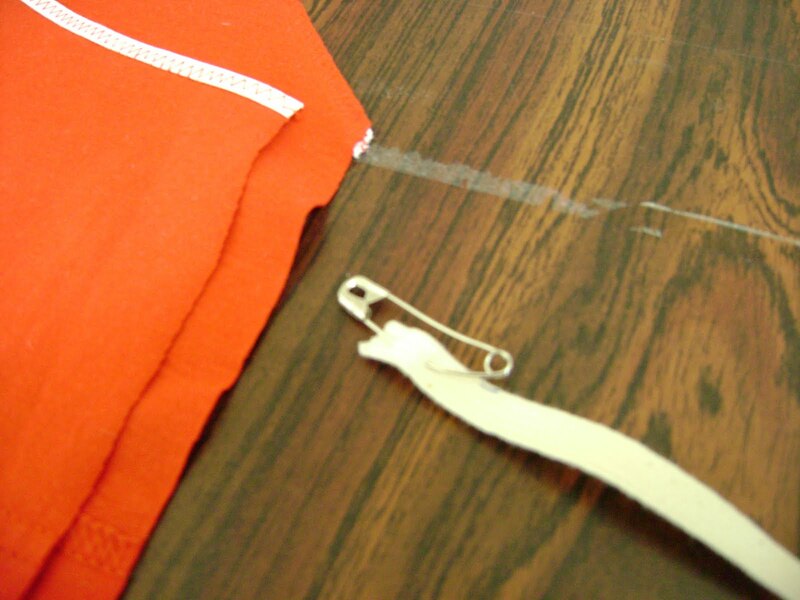 Even if you don’t normally sew, it could be an easy start to learning. First go through all your best fitting undies. Find the crappiest pair. The pair ready to be made into dust rags because the holes are bigger than the leg openings. Carefully cut them apart. Cut right next to the elastic. Do not cut the crotch apart. Leave it for now. No, there’s no picture for this part. My old undies on the world wide web might be too frightening. 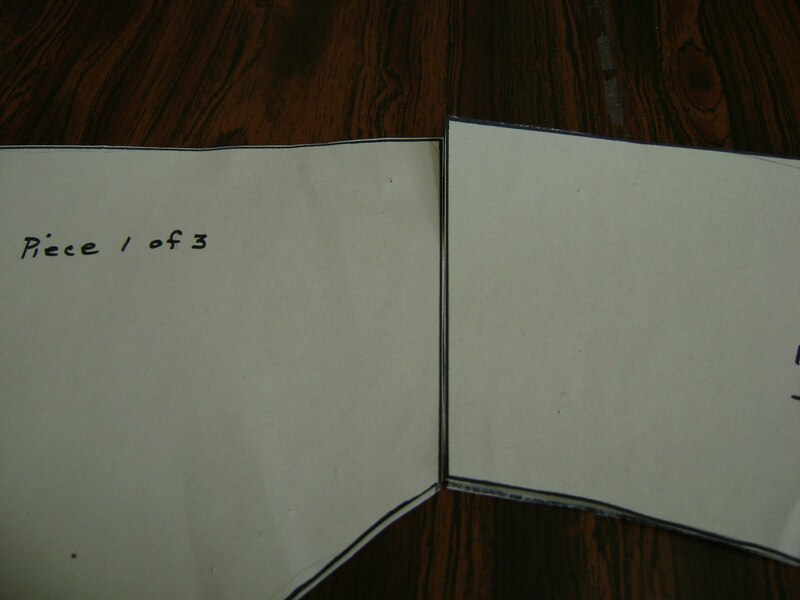 Ok, with the elastic removed fold them in half length wise and lay them on a piece of paper. It could be wrapping paper, butcher paper, wax paper, or even old newspapers. Now trace around them with pencil. Use pencil first so you can erase if you need to. After you get them traced then go back with a ruler and straighten your lines. 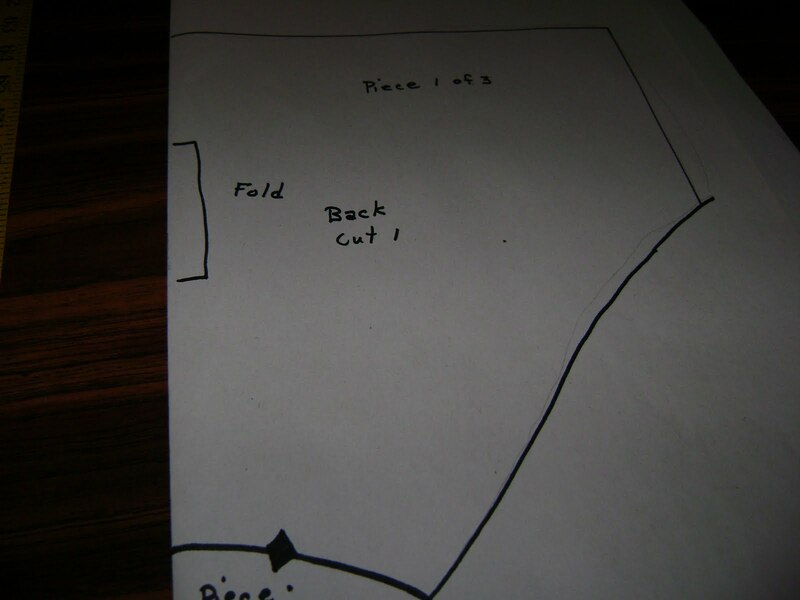 It’s very hard to make straight lines when tracing. After you get them somewhat straight then go over the lines with a dark marker. You don’t have to but it makes the pattern look prettier. Here’s my traced pattern. What are the black diamonds? Well, in pattern making these are match up marks. 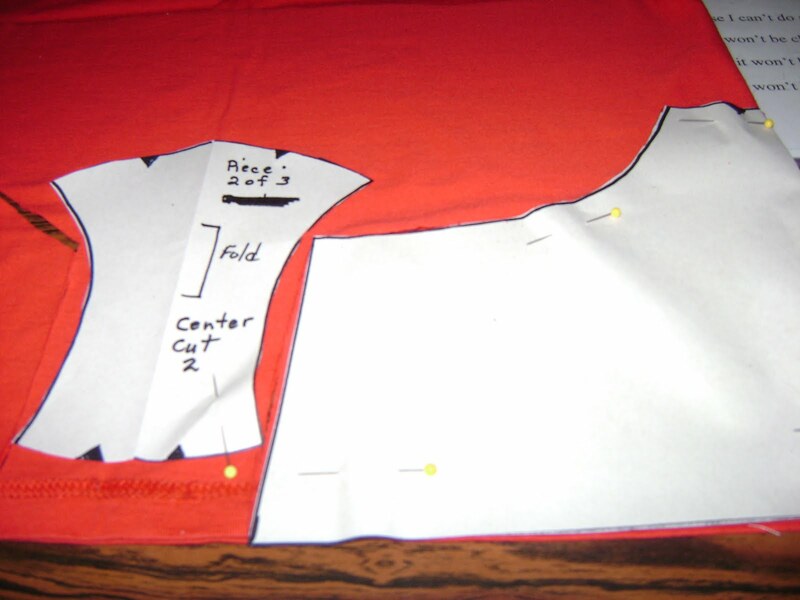 Usually a tiny triangle of fabric is added when cutting out your fabric. It is cut out from the cutting line…. not into it. You match these notches when pinning your pieces together. 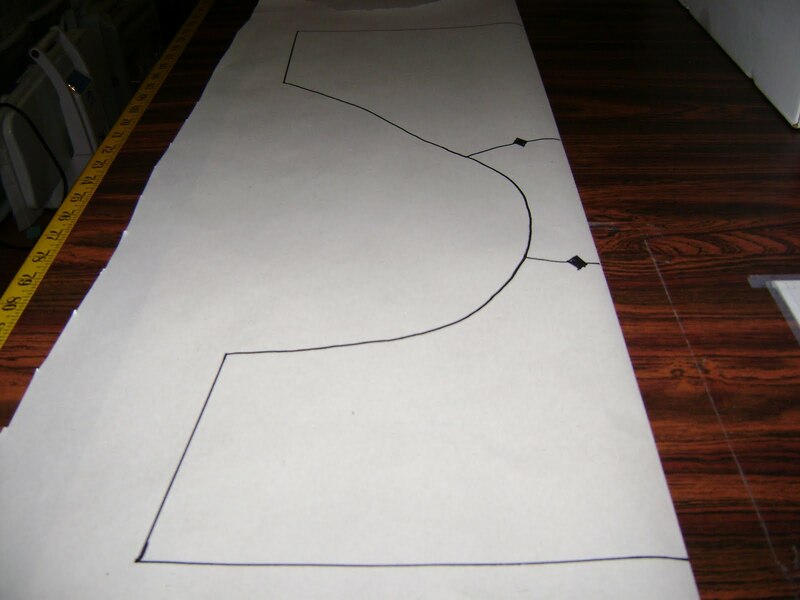 After you get your undies traced, you need to mark your pattern so you can orient it right on the fabric. As you can see, I marked where the fold is. 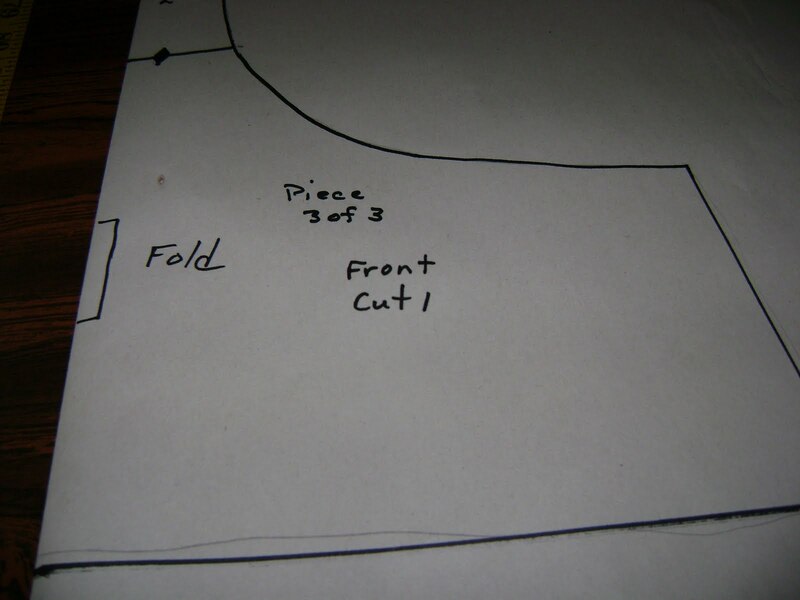 I marked what the pattern piece is, which piece among how many, and how many pieces of fabric to cut. 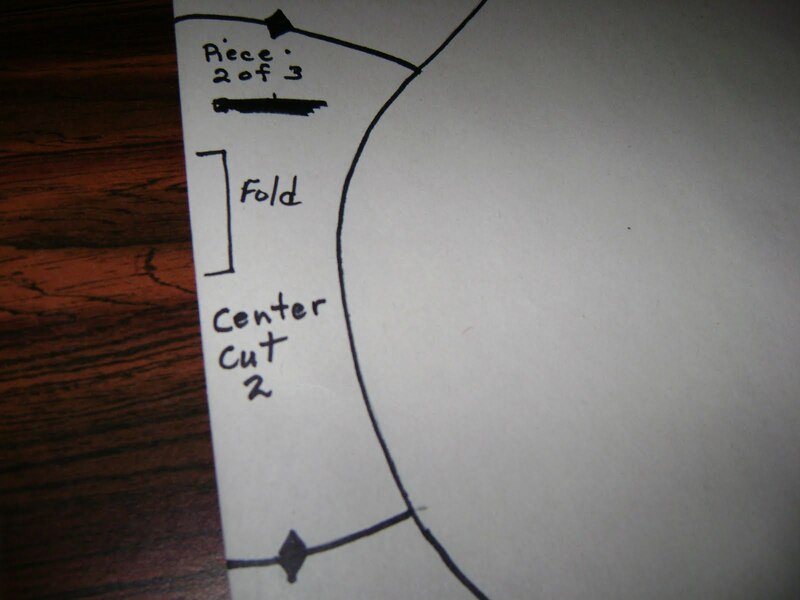 The crotch gets two pieces of fabric cut identical while the front and back only have one piece cut on the fold. As you can see this pattern is the front. Now you can cut the pattern out of the paper. 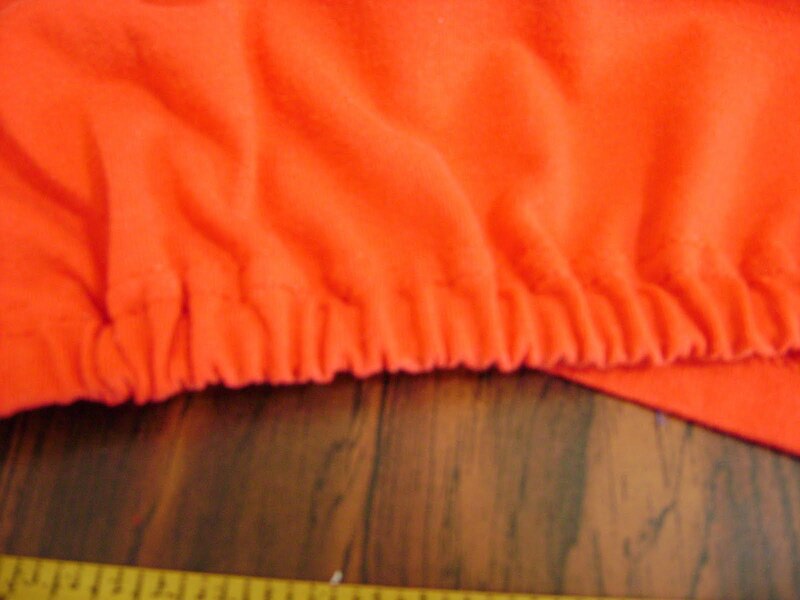 Check to be sure that what will be your side seams are even length top to bottom. If not then adjust your pattern and cut it out again. Ok, now it’s time to cut out your fabrics. For the undies there is no a seam allowance added. 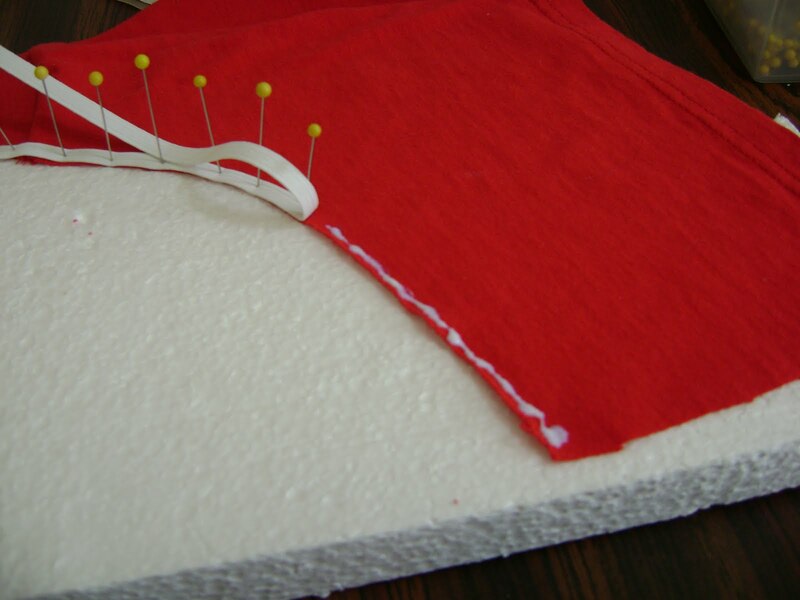 The t-shirt fabric is stretchy enough and the seams will be small enough so that an extra seam allowance is not necessary. I would suggest that you only make one pair for now. If for some reason the undies don’t fit properly when finished, you won’t have wasted too much fabric. See…. I really am going to use left over t-shirt fabric. Bright red for these. 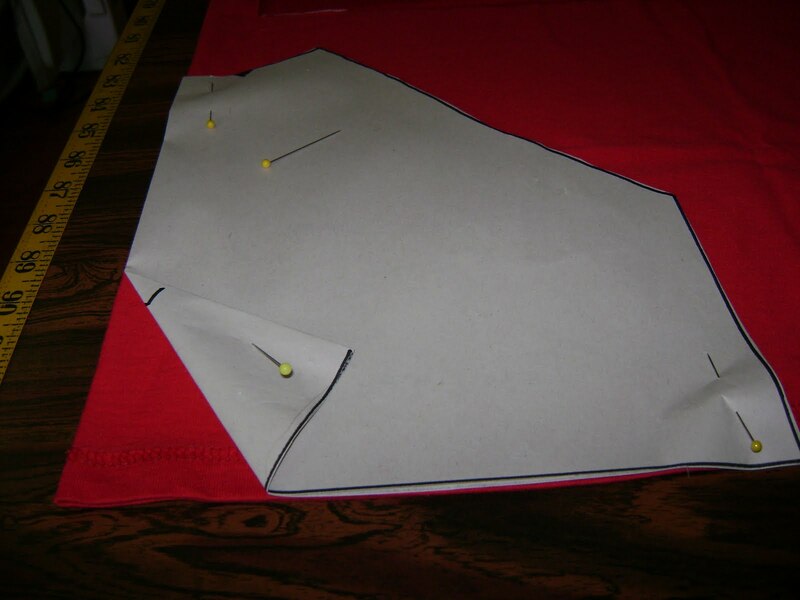 Lay your pattern on the fabric so the fold line of the pattern is on the fold of the fabric. I folded the pattern back for this picture in order for you to see where I placed the top edge of the pattern piece. The t-shirt has a hem already in it so why not take advantage of it. 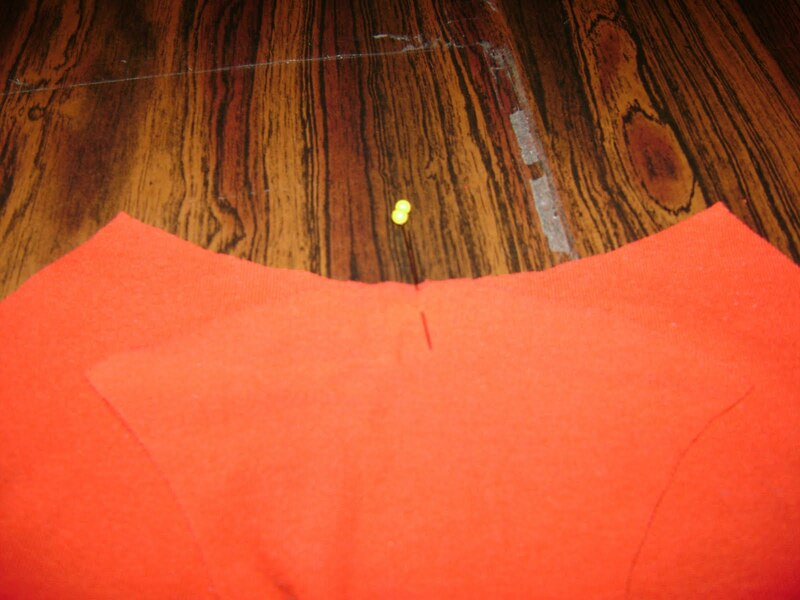 The hem is where the waistline elastic will go. 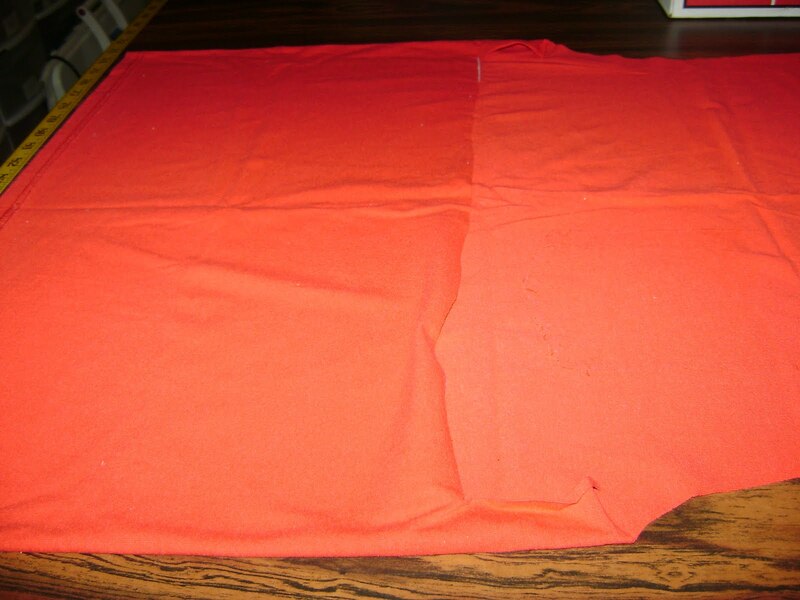 Lay out the other pieces on the fabric. You can flip the pattern over if you want rather than turn the fabric over. Just be sure you put the top of the pattern piece on the t-shirt hem. The two crotch pieces will not be on a fold. It worked out better this way although if I need to fold it when cutting fabric for another pair I could. We want to get the most we can out of our fabrics so we need to think about things like that. When you have all your fabric pieces cut it’s time to start putting them together. Start with the crotch pieces. 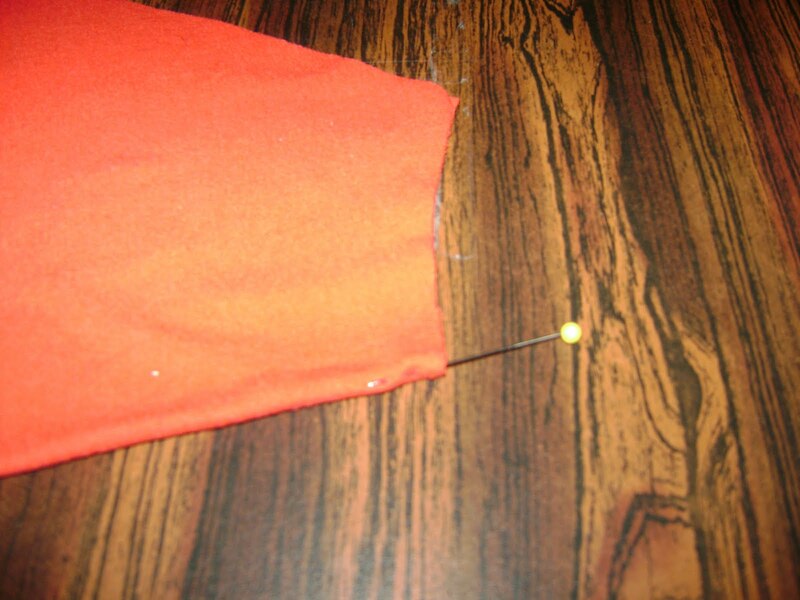 Fold both pieces together to find the center and put a pin there. Like this. Now find the center of the back and put a pin there. Like this. 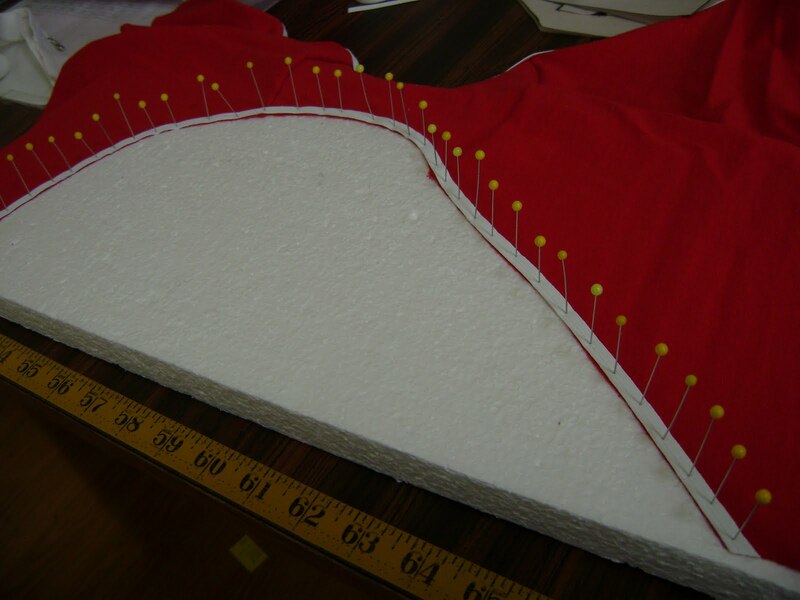 Now lay the crotch pieces on top of the back, matching up the pins. Remove one pin and put it through all the fabric. Remove the other pin. Match up the ends and put a pin in each. Find the middle between an end pin and the center pin. Match the edge of the fabrics and place a pin there. Do the same on the other side. You may have to work with these to be sure the fabric stays even. 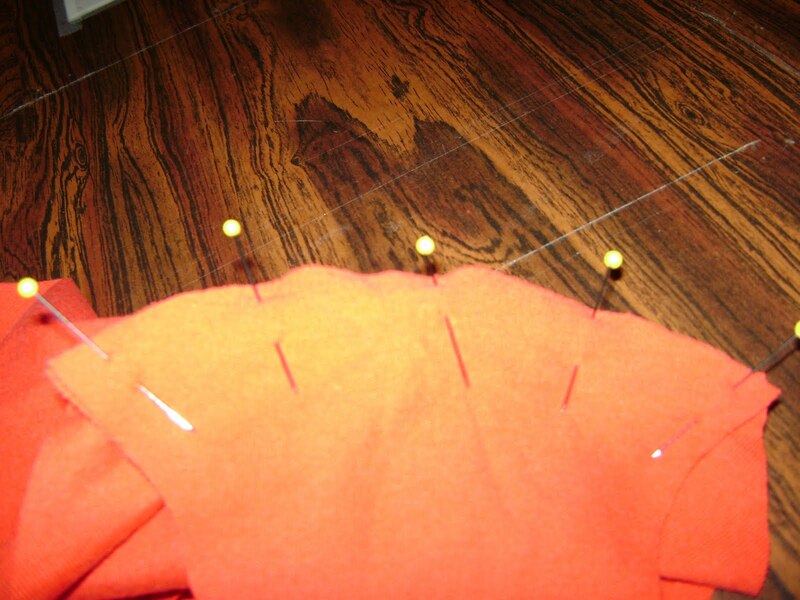 If you need more pins to hold it all even then divide the fabric between the pins and put in more pins. Now do the same thing with the other end of the crotch pieces and the front. A hint: the crotch piece is larger on the back side and smaller on the front side. Look at your original pair to see what I mean. Now sew where you have it pinned. Use a 1/4 inch seam or maybe a little less. Then go back and zig-zag the edge just outside the seam line. 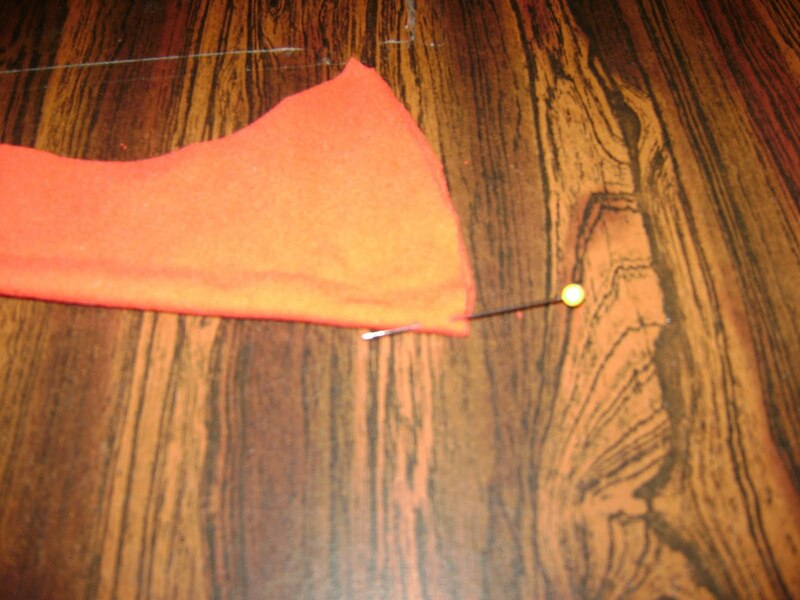 (sorry no picture) For the new sewer this means to sew between where you sewed it together and the outside edge. This will give the seam a nicer finish. Now you need some elastic. I’ve had this package for a very long time. I paid $1.99 for 8 yards. 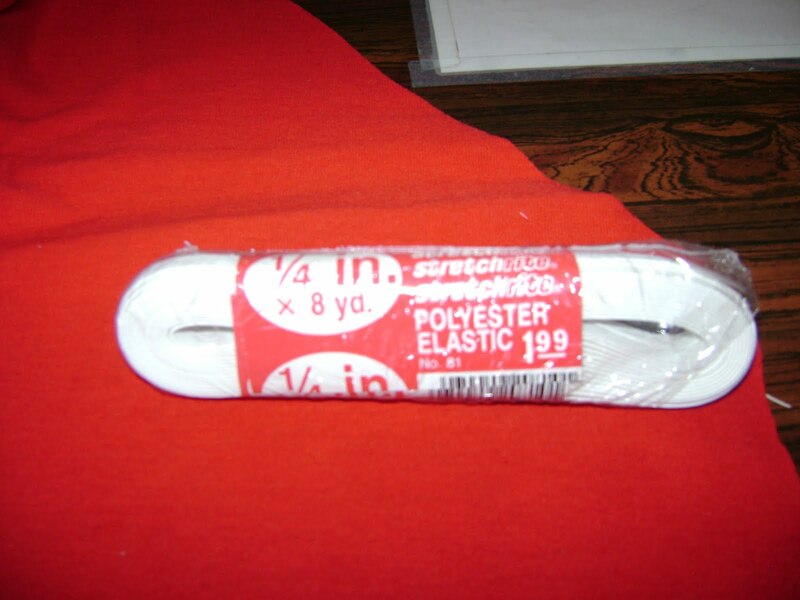 I believe elastic sells for about .50 a yard these days. I was having trouble pinning the elastic so I decided to use a quilter’s trick. 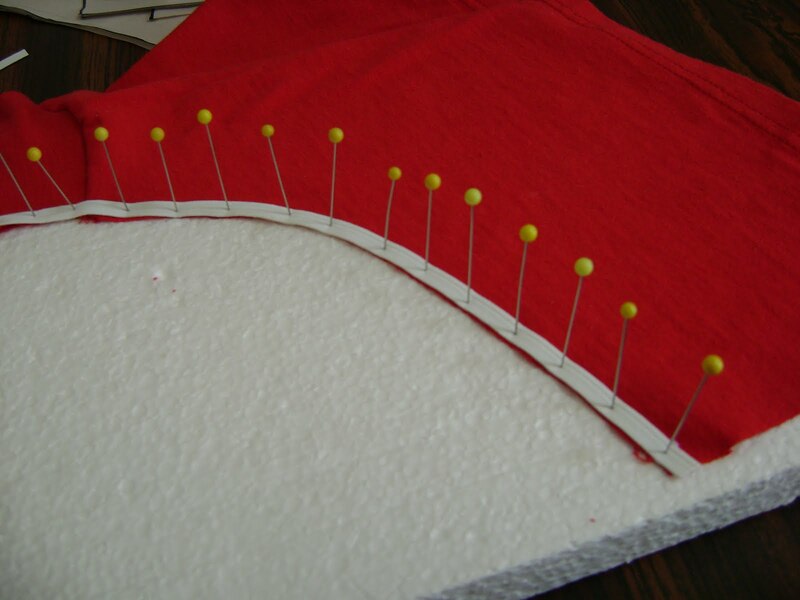 I used white school glue to attach the elastic to the fabric instead of pinning. Yup, plain ol’ school glue like Elmer’s. It holds enough to sew things together and washes out. How much elastic? Well, enough to cover the leg opening without stretching it. I used a piece of Styrofoam I had laying around. It held everything pinned in place while the glue dried. It could have been a piece of cardboard or a pillow or anything to stick pins into for awhile. When one leg is done then glue the other leg. See how I’ve cut the elastic off right even with the fabric? No stretching and no gathers. 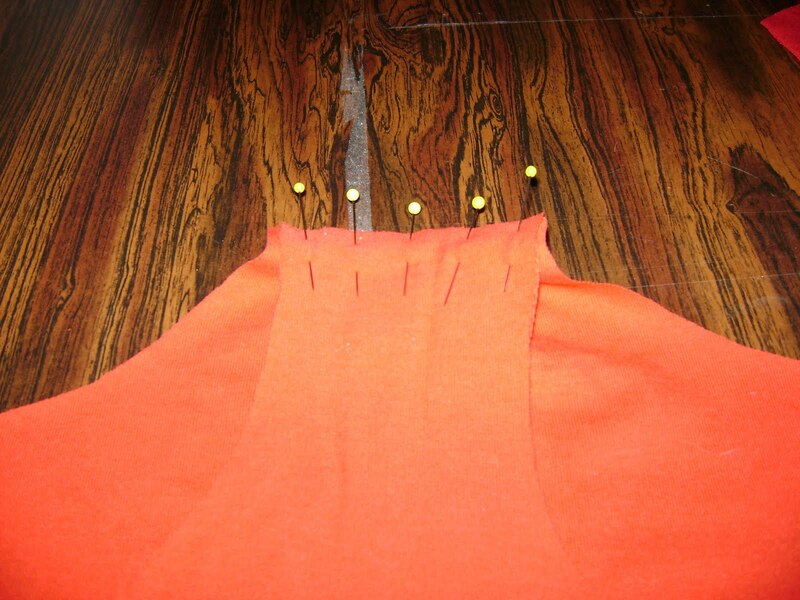 Then go to the sewing machine and do a zig zag stitch on the elastic. 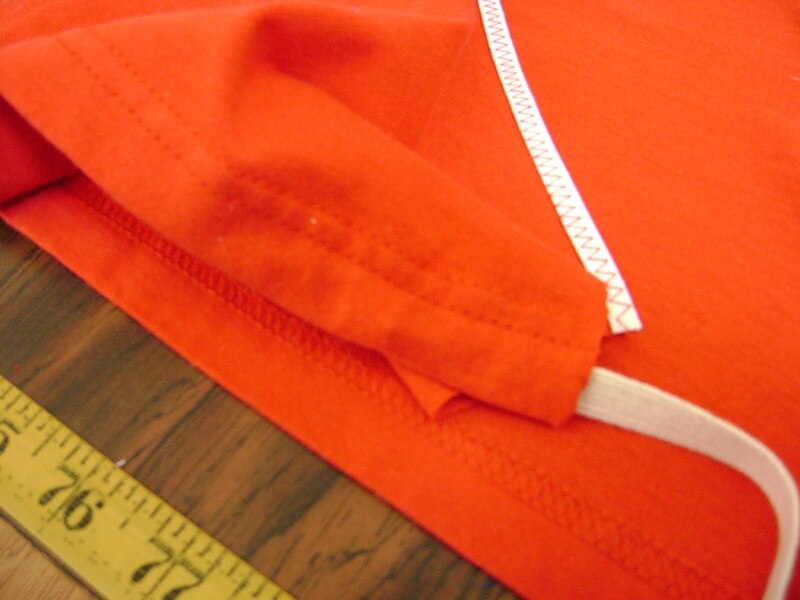 Set your stitch almost as wide as the elastic and a good distance apart. 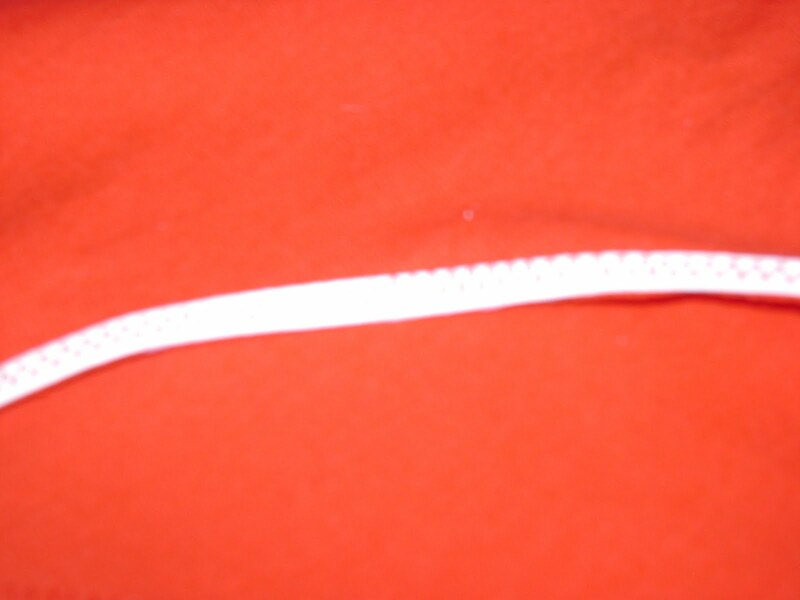 Doing this type of stitch on the elastic allows it to stretch without breaking the thread. If you feel this is not secure enough then stitch it twice instead of closer together. This is the best picture I could get of the stitching. I don’t know why it didn’t show up very well. Try clicking on the picture to enlarge it. Now it’s time to do the waist. Don’t sew the side seams just yet. Save those for later. 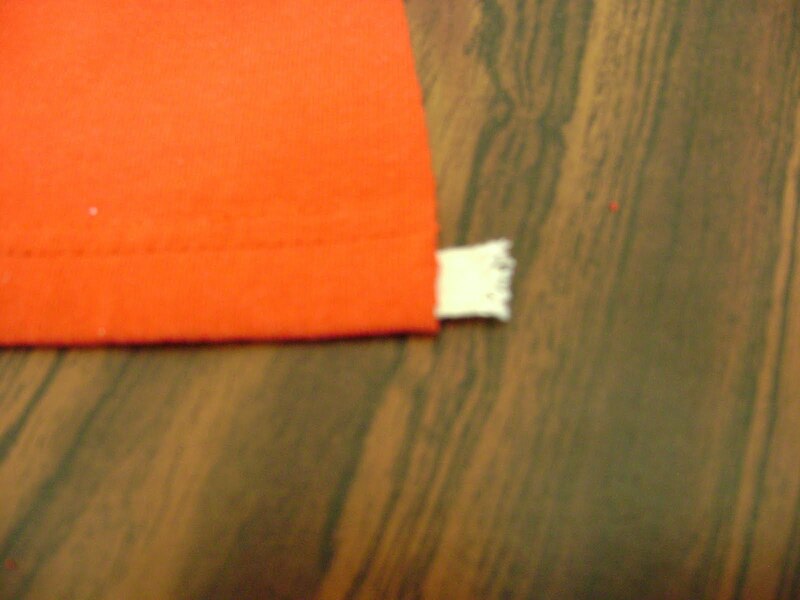 Cut a piece of elastic about 1 or 2 inches shorter than the front. 1 inch for a loose fit. 2 inches for a tighter fit. 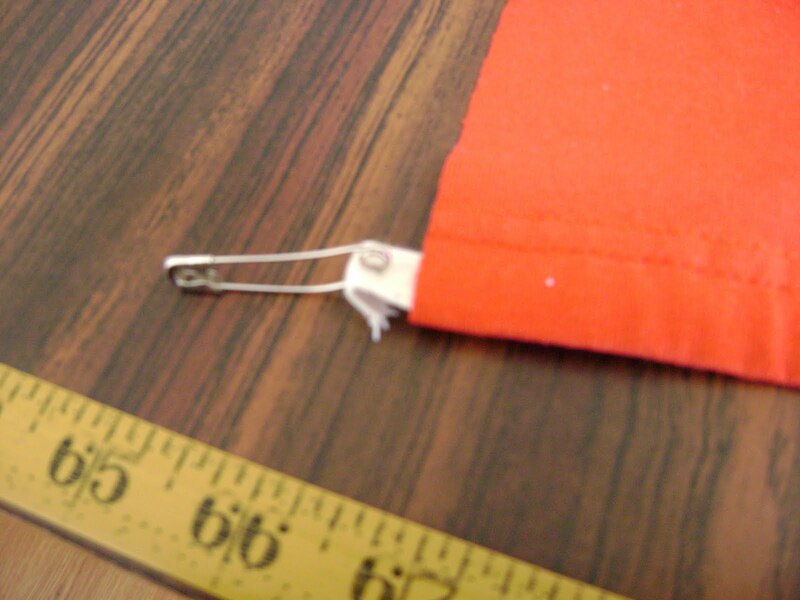 Now find yourself a safety pin and put it on one end of the elastic. Start pushing the safety pin through what used to be the hem of the t-shirt. Be careful not to pull the elastic inside at the other end. You need a small tail left to hold. One side will have the pin come out of it. In between you should have some soft gathers like this. Now sew the elastic tails so they don’t come out. Repeat these steps to put elastic in the back. 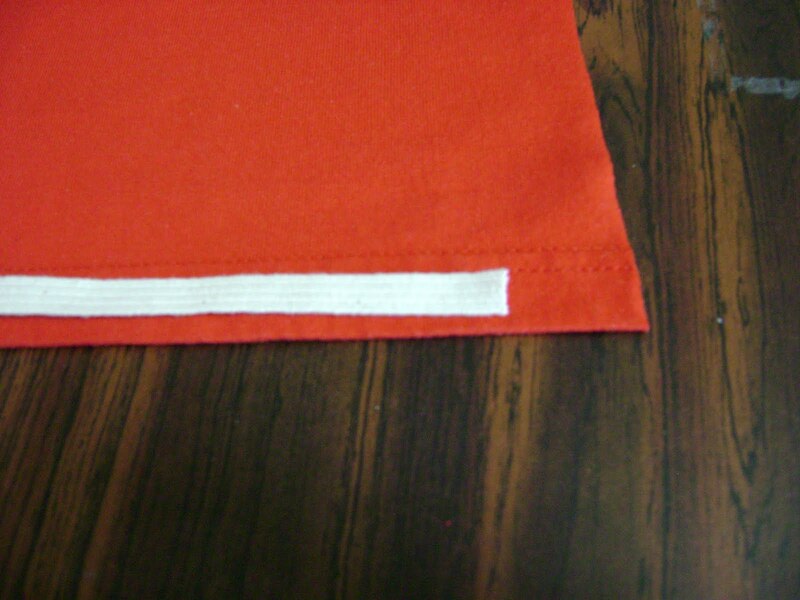 Pin the sides together and sew a 1/4 inch seam. Then zig zag the edges like you did on the crotch seams. This is what you get when you are finished. Oooo…. hot NaNa! All they need now is some lace and bows to make them really girly girly. Please let me know if anything about the tutorial isn’t clear. I’ll edit and do my best to make it more understandable. Patricia, maybe it might be worth sacrificing one pair to give making your own a try? It can't hurt to try… right? Those extra t-shirts aren't doing anything are they? Cindi, I learned almost all my sewing skills from watching my grandmother make my clothes. She even used butcher string to make lace for my feed sack clothes. This entry was posted on November 4, 2009 by Anita in SEWING TUTORIALS, Undies from t-shirts.